The Uralic cline is a concept that was discussed in some detail in the recent Lamnidis et al. palaeogenomics paper on the origin and spread of Siberian ancestry in Europe (see here). It pertains to the most northerly genetic cline that links the populations of West and East Eurasia, and is largely made up of Uralic-speaking peoples rich in Y-haplogroup N1c. 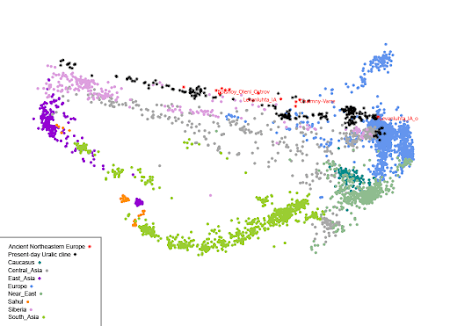 This is what the Uralic cline looks like when inferred from my Global25 Principal Component Analysis (PCA) data. Note that the plot features most of the Lamnidis et al. ancient samples, and they're all more or less sitting along my version of the said cline. The relevant datasheet is available here. Admittedly though, as pointed out by Lamnidis et al., the Bolshoy samples probably aren't those of Uralic speakers because they're dated to 1523±87 calBCE, which predates most linguistic estimates of the spread of known Uralic languages into the Kola Peninsula. 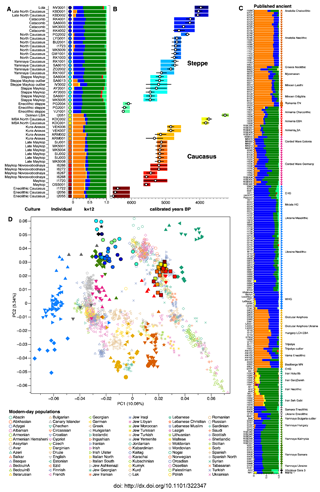 So the important question is why do they cluster along the Uralic cline and 2/2 of the male samples belong to N1c? The most logical explanation, I'd say, is that the Uralic cline actually represents an older, pre-Uralic contact zone between the east and west. Nevertheless, I think it's likely that the Proto-Uralic language formed somewhere in this ancient contact zone, and the early Uralic-speaking peoples used it to their advantage to spread rapidly both east and west, especially during the Late Bronze/Early Iron Age, when they, and their N1c, finally reached the East Baltic region (see here). We do not have a pre-Chalcolithic sample from Armenia. We first model it [Armenia_ChL] as a 2-way mixture of any of WHG, EHG, CHG, Iran_N, Levant_N, Anatolia_N (Table S7.18), but we find no pair of these populations that could be ancestral to Armenia_ChL. We next model it as a 3-way mixture (Table S7.19), and determine that Armenia_ChL can be modeled as 18.3±1.5 EHG, 29.2±2.4% Iran_N, and 52.5±2.2% Anatolia_N. 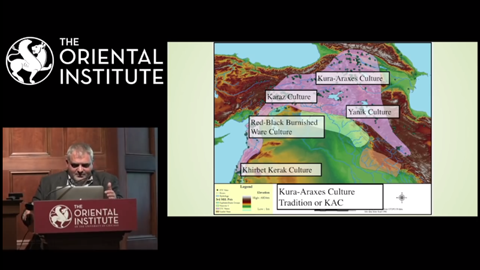 In the absence of a pre-Chalcolithic sample, we cannot be certain whether the Neolithic population of Armenia (which borders Anatolia from the east) was similar to that of Northwestern Anatolia and experienced gene flow from the east and north, or the reverse. Since then, a lot of opinions have been posted in the comments at this blog and elsewhere about the possible origin and significance of Armenia_ChL. It seems to me that many people see Armenia_ChL as more or less an example of the indigenous Neolithic and Chalcolithic peoples of the South Caucasus. But some have argued that Armenia_ChL was in large part of Central Asian origin and concocted various mixture models to try and back up this rather strange claim. To me, it was always obvious that Armenia_ChL harbored very recent admixture from the Pontic-Caspian steppe, because I couldn't reconcile its relatively high level of Eastern European Hunter-Gatherer (EHG) ancestry with a deep origin south of the Greater Caucasus range. Moreover, in any decent Principal Component Analysis (PCA), like the one below, Armenia_ChL appears to form two subtle sub-clusters, with three of its individuals "pulling" more strongly towards Eastern Europe. This suggests that the EHG admixture in Armenia_ChL was present at variable levels and thus likely to be recent, because it didn't yet have time to diffuse evenly throughout the population. Also, two out of the three Armenia_ChL individuals who are "pulling" north belong to steppe-specific mitochondrial (mtDNA) haplogroups. Armenia_ChL I1634 belongs to mtDNA haplogroup H2a1, which is seen in ancient samples from the Pontic-Caspian steppe associated with the Khvalynsk, Sredny Stog and Catacomb cultures, while Armenia_ChL I1409 belongs to mtDNA haplogroup U4a, which is found in numerous ancient samples, especially foragers, from the Pontic-Caspian steppe and other parts of Eastern Europe (see here). Coincidence? Surely not. The idea that Armenia_ChL represents a long-standing indigenous Transcaucasian population also took a major hit recently with the release of the Wang et al. manuscript on the genetic prehistory of the Greater Caucasus. The preprint included samples from the Eneolithic Caucasus dated to earlier than Armenia_ChL (4594-4404 calBCE vs 4330-3985 calBCE) which looked typically Caucasian and lacked any discernible signals of ancestry from the steppe. Below is a PCA from Wang et al. featuring both the Eneolithic Caucasus and Armenia_ChL samples. Unfortunately, modeling the recent ancestry of Armenia_ChL is still difficult, because the genotype data from Wang et al. haven't yet been released, so currently there is still no pre-Armenia_ChL sample available from the Caucasus for me to work with. The earliest post-Armenia_ChL sample is Armenia_EBA I1658, dated to around a thousand years too late (3347-3092 calBCE). However, this individual is associated with the Kura-Araxes culture, which is generally seen as a direct successor to the native Neolithic cultures of Transcaucasia, and appears to be practically indistinguishable from the Eneolithic Caucasus trio in the Wang et al. PCA. Thus, pending the release of a pre-Armenia_ChL sample I might be able to use Armenia_EBA I1658 as an effective proxy for such a population. Below are a couple of successful two-way qpAdm mixture models for Armenia_ChL and Armenia_ChL I1634, featuring Armenia_EBA I1658 and Sredny_Stog I6561 (the output for Armenia_ChL I1409 looked wobbly, probably due to a lack of markers). The reason I decided on Sredny_Stog from the North Pontic steppe as the surrogate for the steppe ancestry is because of the position of Armenia_ChL in the Wang et al. PCA relative to Eneolithc Caucasus, which suggests gene flow into the former from a more westerly steppe source than, say, Khvalynsk from the Samara region. Using these reference samples, the inferred ratio of steppe admixture in Armenia_ChL is around 15%, which I think makes sense, more or less, considering its position in both of the PCA above. The presence of a significant, unambiguous signal of steppe ancestry in a group from a rich archeological site in Chalcolithic Transcaucasia might be very important in the context of the Proto-Indo-European (PIE) homeland debate. That's because it suggests that there was a movement of peoples potentially speaking dialects of PIE from the Eneolithic Pontic-Caspian steppe, the main candidate for the PIE homeland based on historical linguistics data, into cultural hubs south of the Caucasus, which may have acted as early dispersal points for Indo-European languages into other parts of the Near East, such as Anatolia. Admittedly, though, I'm still a fan of the Balkan route for the introduction of Hittite and other Anatolian languages into Anatolia, despite recent claims in scientific literature that this scenario wasn't corroborated by ancient DNA (see here). Over at PNAS at this LINK. 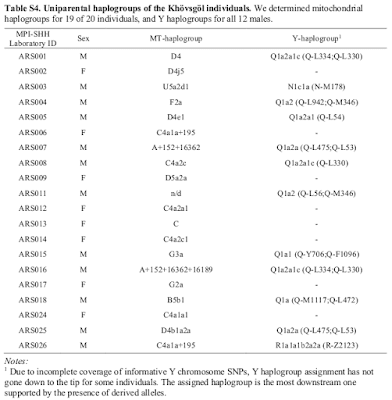 Below is the abstract and a table with the uniparental haplogroups for the 20 ancient samples from the paper. Emphasis is mine. This year, ancient DNA has revealed that the populations associated with the Maykop and Yamnaya archeological cultures were genetically distinct from each other, and, in all likelihood, didn't mix to any significant degree. Case in point: an ADMIXTURE analysis from Wang et al. 2018. No doubt, this is quite a shock for many people, especially those of you who consider Maykop to have been a Proto-Indo-European-speaking culture that either gave rise to Yamnaya or at least Indo-Europeanized it. So now, if you still want to see Maykop as the Indo-Europeanizing agent in the Pontic-Caspian steppe, you'll have to rely solely on archeological and linguistics data, and also keep in mind that ancient DNA has slapped you in the face. In just a few years, ancient DNA has provided us with plenty of shocks, but this is arguably among the biggest. However, I honestly can't say that it was a huge surprise for me, because I tentatively predicted this outcome more than two years ago based on a handful of mitochondrial (mtDNA) haplotypes (see here). Certainly, analyzing genome-wide genetic data is what I thrive on, but if that's off limits, then eyeballing even a few mtDNA markers can also be very useful. I'd say that what they're almost suggesting there is that the Caucasus and Steppe clusters, hence also the Maykop and Yamnaya populations, shared significant maternal ancestry. If this were true, then perhaps it might mean that the Pontic-Caspian steppe was Indo-Europeanized via female-biased migrations from Maykop? Yes, perhaps, if this were true. However, it's not. 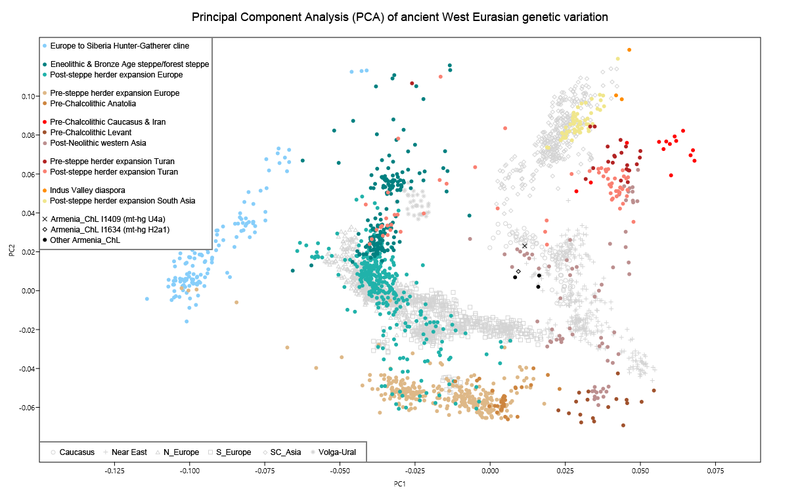 To be sure, Yamnaya does show a close genome-wide genetic relationship with an earlier group from the North Caucasus region: the so called Eneolithic steppe people. But they can't be linked to Maykop or even the roughly contemporaneous nearby Eneolithic Caucasus population, and seem to have vanished, at least as a coherent genetic unit, just as Maykop got going. Wang et al. 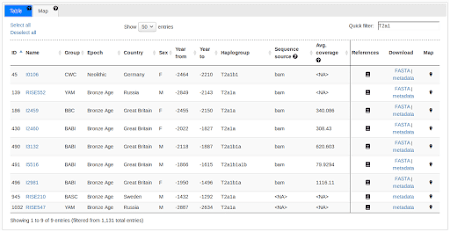 managed to sequence three Eneolithic steppe samples with the following mtDNA haplogroups: H2, I3a and T2a1b. H2 is too broad a haplogroup to bother with, but here are the results for I3a and T2a1b from the recently launched AmtDB, the first database of ancient human mitochondrial genomes (see here). 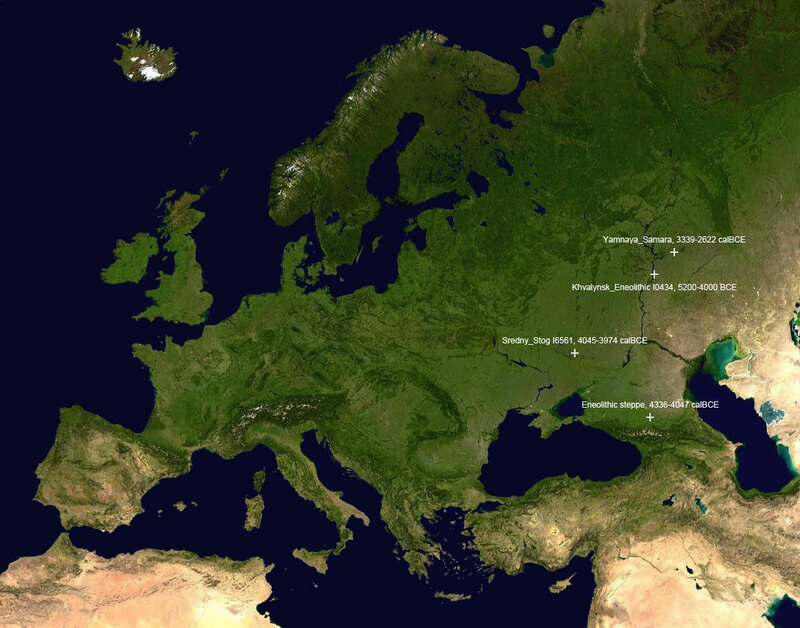 In a database of 1,131 ancient samples, I3a shows up in just five individuals, all of them associated with Yamnaya-related archeological cultures and populations: Poltavka (BARu), Unetice (UNC), Corded Ware (CWC), and Bell Beaker (BBC). Similarly, T2a1b shows up in just four individuals, all of them associated with Corded Ware (CWC) and Bell Beaker-derived Bronze Age Britons (BABI). And if I go back a step to T2a1, then the list reveals two Yamnaya individuals from what is now Kalmykia, Russia. 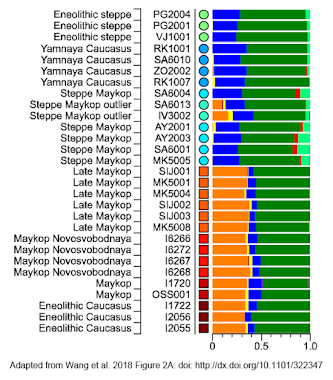 Thus, using just two mtDNA haplotypes I'm able to corroborate the results from genome-wide genetic data showing a close relationship between Eneolithic steppe and Yamnaya. So like I said, useful stuff. 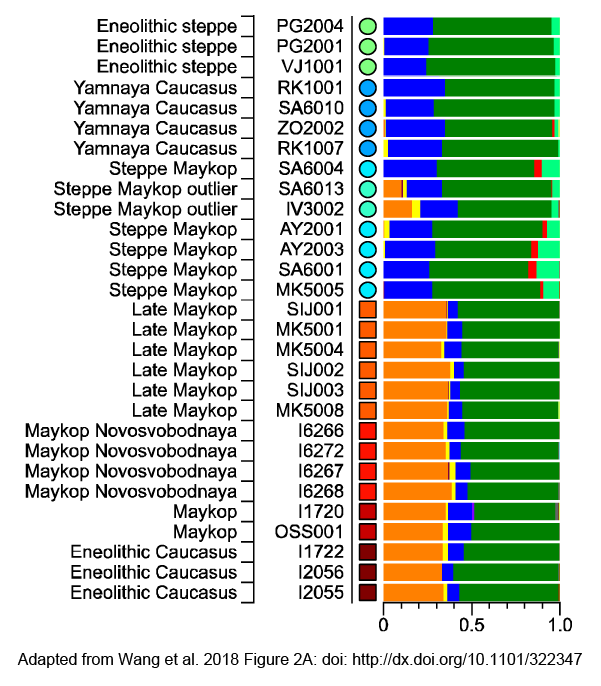 This obviously begs the question: what does the AmtDB reveal about Maykop mtDNA haplotypes, especially in the context of the genetic relationship, or rather lack of, between Yamnaya and Maykop? Yep, again, the AmtDB basically corroborates the results from genome-wide genetic data. But don't take my word for it. Stick the currently available Maykop mtDNA haplogroups into the AmtDB and see what happens (for your convenience I've made a list available here). Considering the close geographic and temporal proximity of Maykop to Yamnaya, you won't see an overly high sharing rate with Yamnaya and closely related populations. 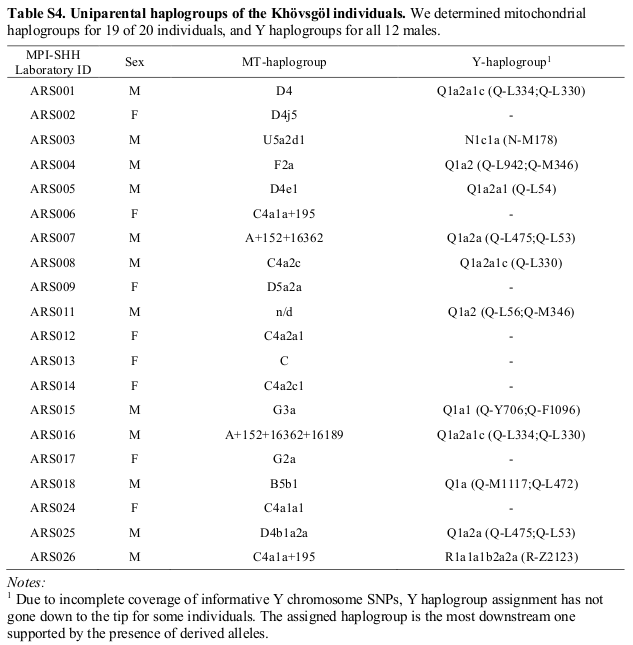 Moreover, Maykop shows several haplogroups that appear highly unusual in the context of the Eneolithic and Bronze Age steppe mtDNA gene pool, and, instead, link its maternal ancestry to those of the early European farmers, West Asians or even Central Asians, such as HV, M52, U1b, U7b and X2f.